Now that’s what I call an easy lunch! 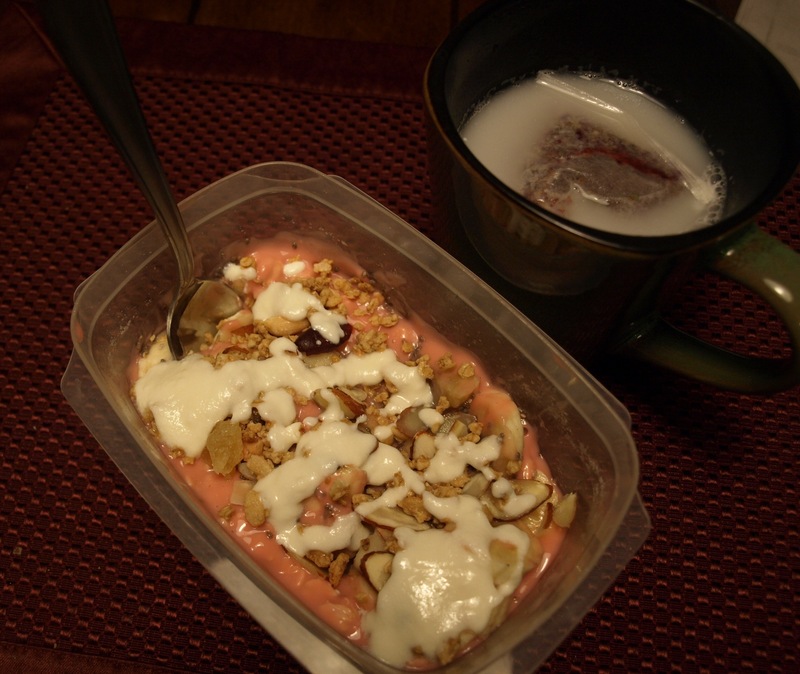 With Dessert themed breakfast creations lately, Court and I made a Red Velvet Cake Over Night Oats! This combo was perfect, and once again like dessert for breakfast. “The EasyLunchbox system makes it simple to organize, and quickly pack healthy lunches without wasting money, time, paper or plastic. Born out of my response to unhealthy school lunch programs, EasyLunchboxes.com started from the desire to send my 3 kids to school with a nutritious meal, using little to no wasteful packaging. 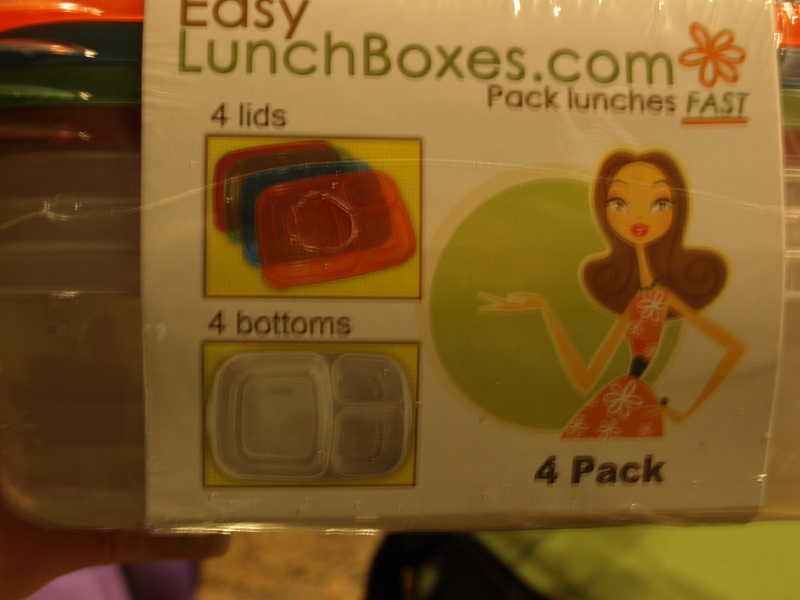 But the EasyLunchbox System is not just for kids. Adult size meals fit perfectly too. 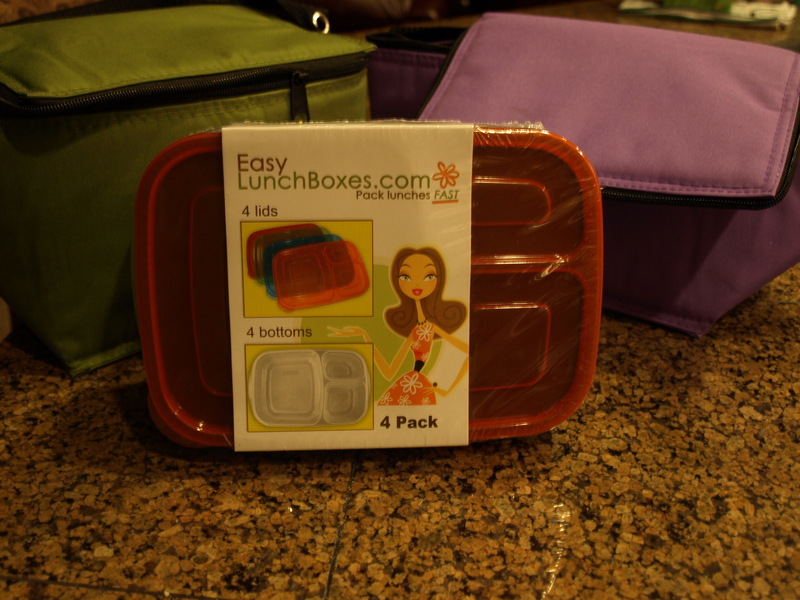 The EasyLunchbox System has been rated TOP CHOICE by many independent reviewers. 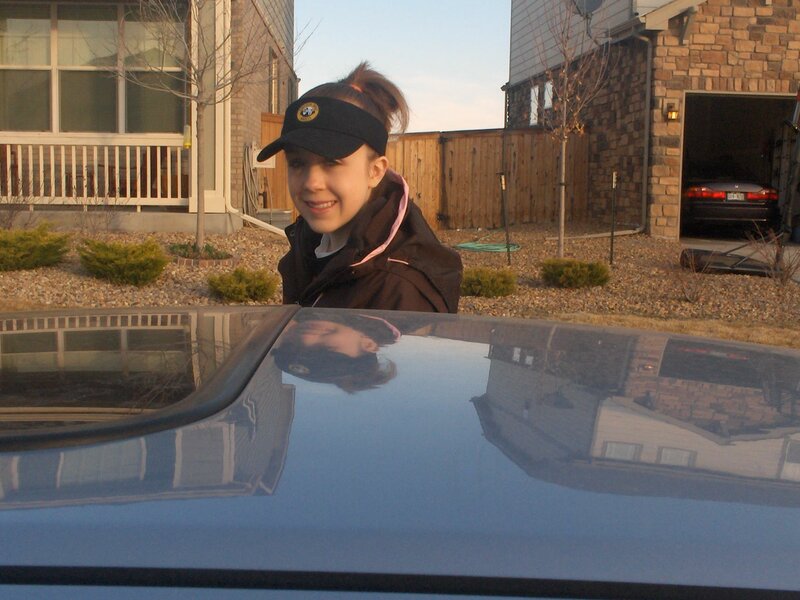 I was like other frustrated moms – I didn’t like throwing together lunches during the morning rush. So much time was wasted sorting through a cabinet of mismatched food containers while trying to pack 15-25 well-balanced lunches per week. 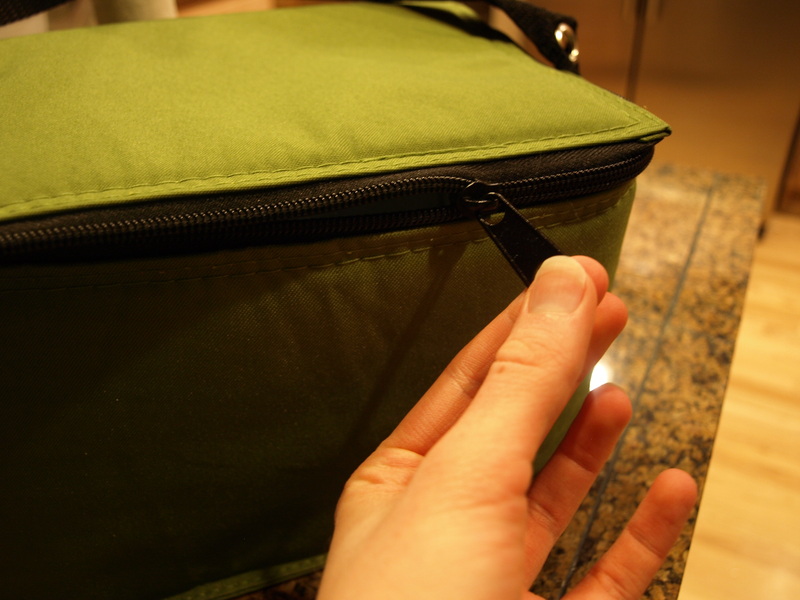 I struggled to find something that would help me pack lunches fast, without resorting to the ‘convenience’ of expensive, pre-packaged ‘fast-food.’ Most importantly, I wanted something attractive, eco-friendly, and made of food-safe materials that I didn’t have to wash by hand. 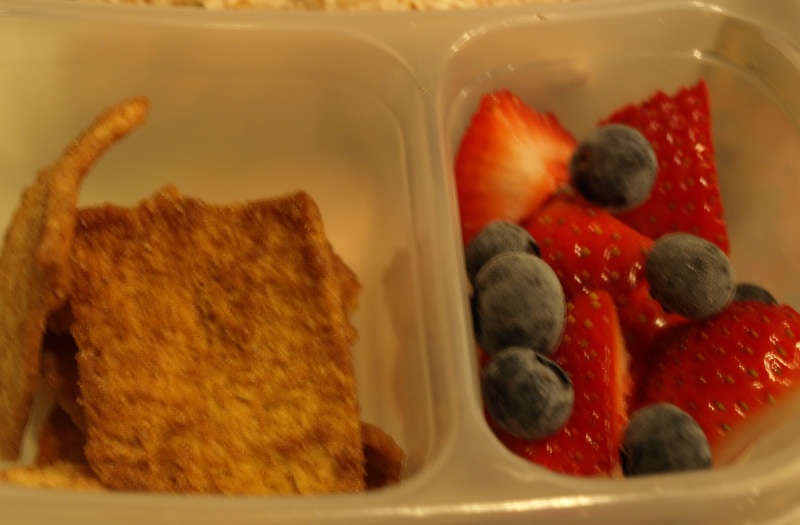 My clever solution to the lunch-packing chore is the simple two piece EasyLunchbox container : The bottom has three compartments to hold an entree or sandwich and two side dishes. The fitted lid (which comes in 4 colors) covers all three compartments at once. No more squished sandwiches, mismatched plastic container pieces to keep track of (matching up all those bottoms and lids was the thing that drove me nuts!) or wasteful baggies. Fits perfectly inside the roomy EasyLunchbox custom carrying bag. And there is still plenty of room to throw in an extra snack or two, whole fruit, perhaps a thermos of soup, drink and ice block. Flexibility is key, and since so many different things can fit, no matter what menu you choose to include, it packs easily and quickly. 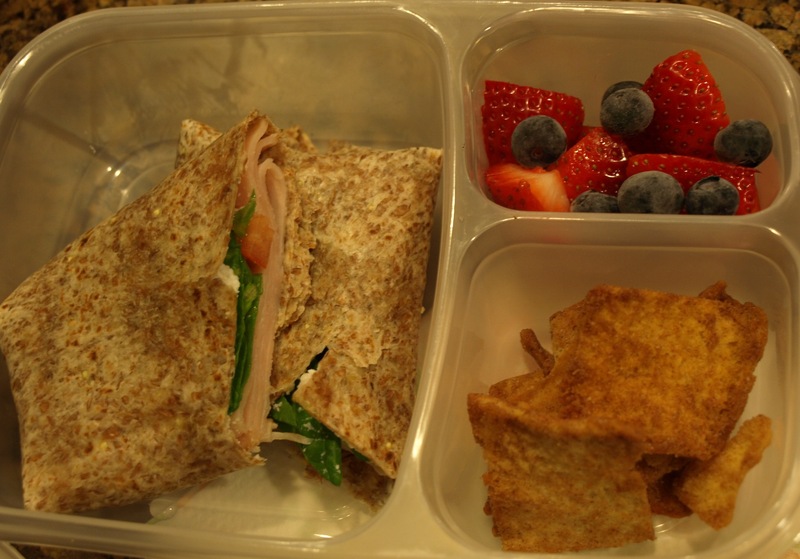 It’s amazing how much faster, greener, & easier lunch box packing is with the EasyLunchbox system. Teens eat lunch at school every day. Teens can help save the planet, one lunch at a time, by using reusable containers to pack and prepare their own lunchbox at home. 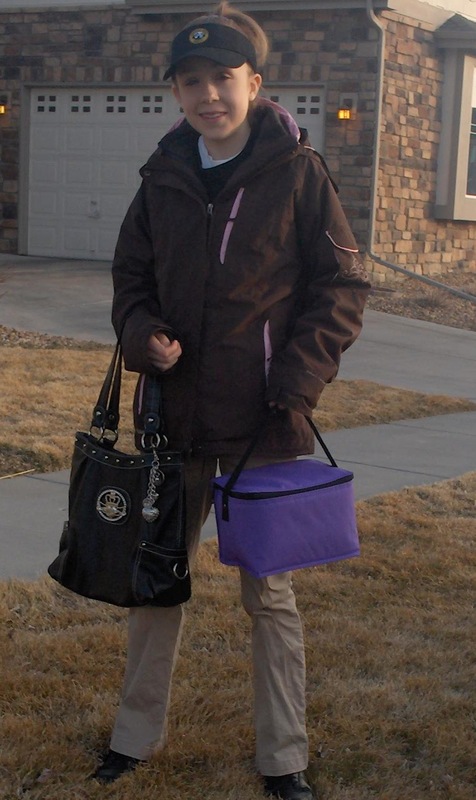 The bags are super cute, and have a zipper which I like instead of Velcro. 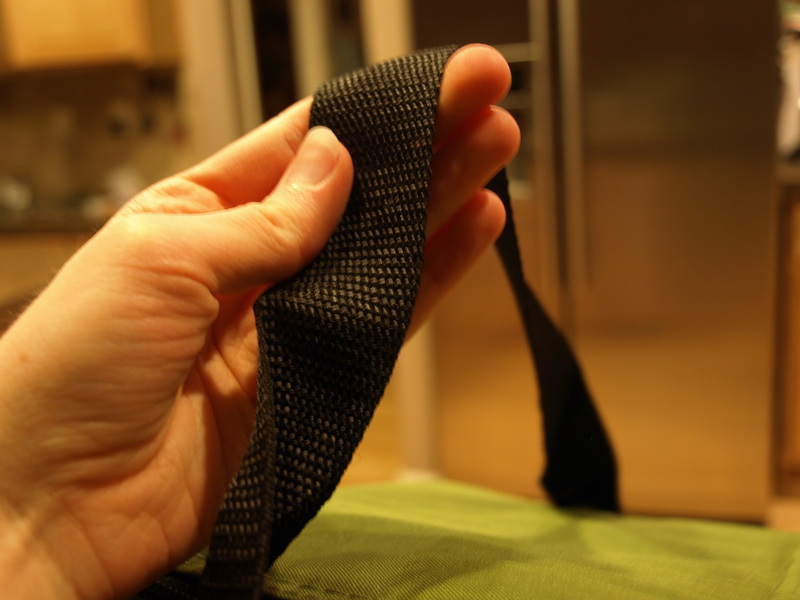 And even a nice strap for easy carrying. 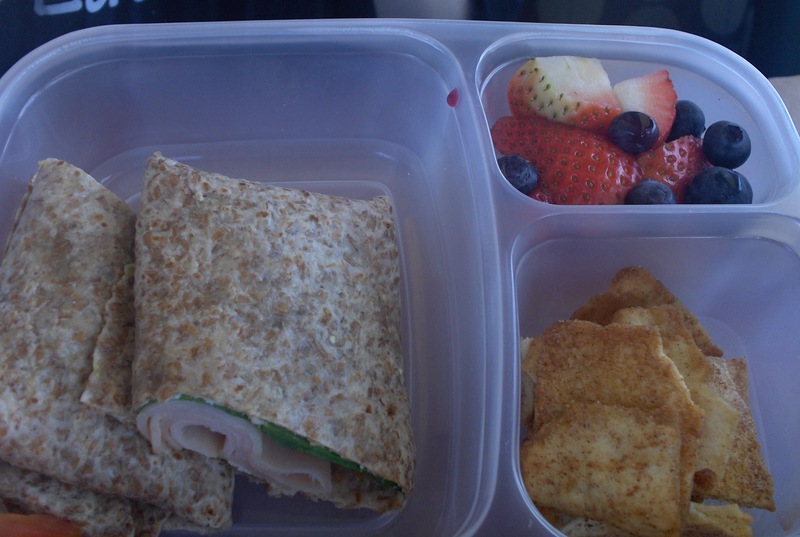 I just gotta say, I have never packed a lunch so quickly! Instead of digging around for 50 containers to fit our whole lunch in, we can now just put it into one nicely organized container. The size of each compartment really makes it easier to pack the right “portion size.” Alot of people use baggies that they fill to the brim, and don’t realize how much they are eating! This container helped us to make the perfect size lunch. Verdict: Easy to use, microwave-dishwasher-freezer safe, perfect size to make perfect portions, fits into a fashionable lunch bag! The French Meadow Bakery tortillas we got sent were used to created the main dish if this lunch. 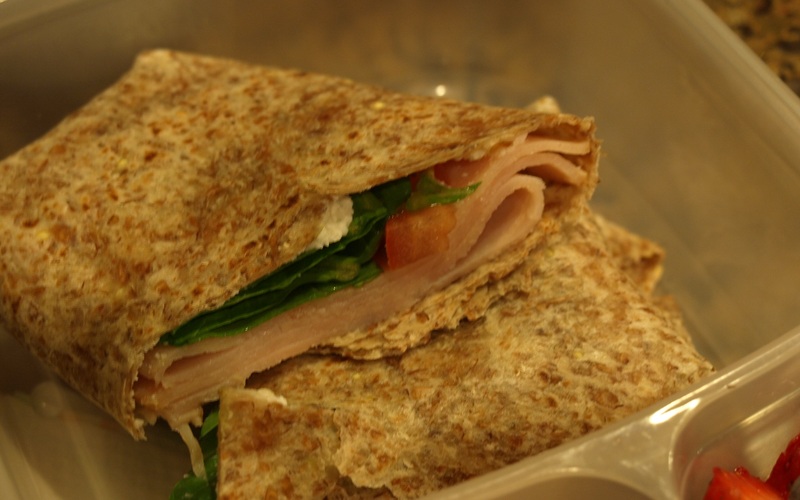 In the wrap was riccota, humus, spinach, tomato, and honey glazed ham. 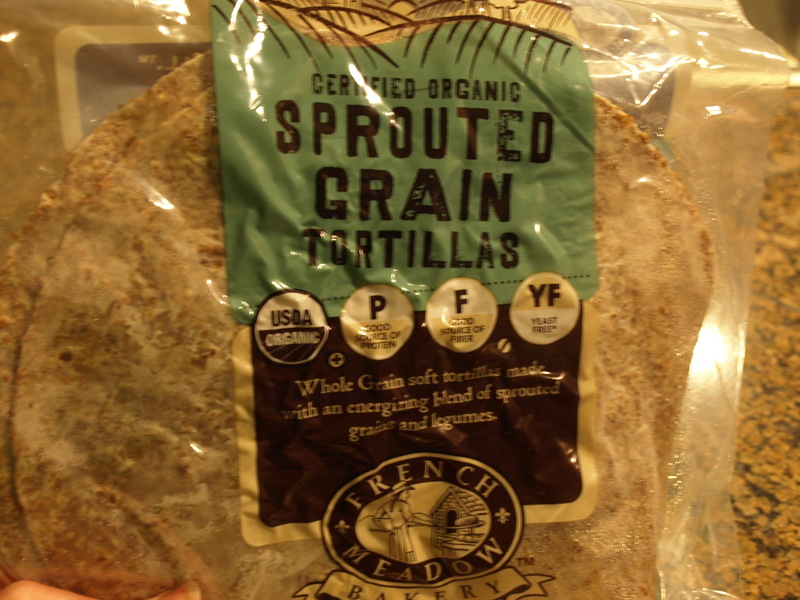 Verdict: We love all of the grains in this tortilla and it actually fit all of the food inside, without breaking when wrapped up like other tortillas do. Great taste, and the perfect wrap to the food you want to package up inside. 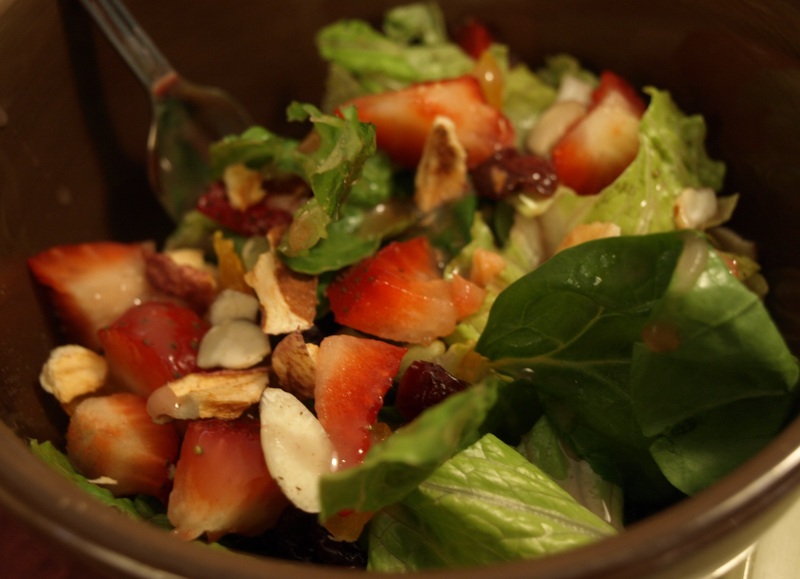 The sides to this meal included berries, and Cinnamon sugar Stacey’s Chips. 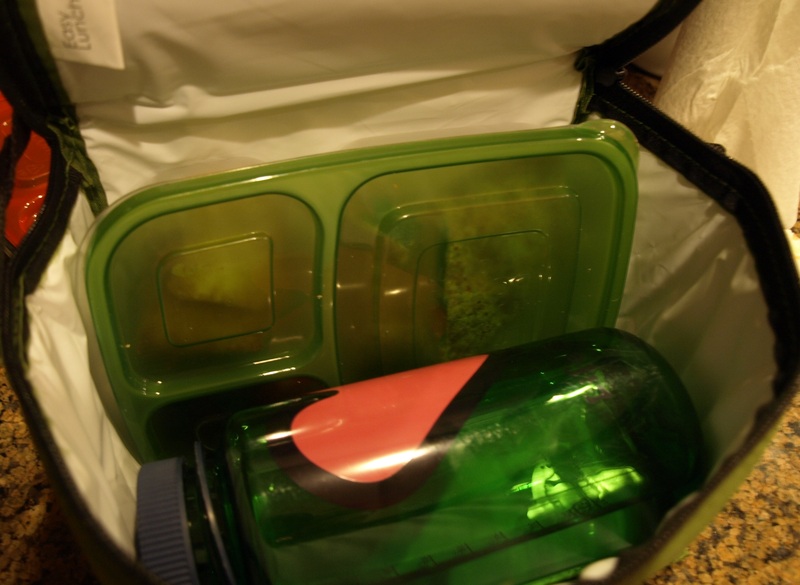 This easy lunch bag even fit my large watterbottle! That is a bonus to me, because usually I would have to carry that separately. 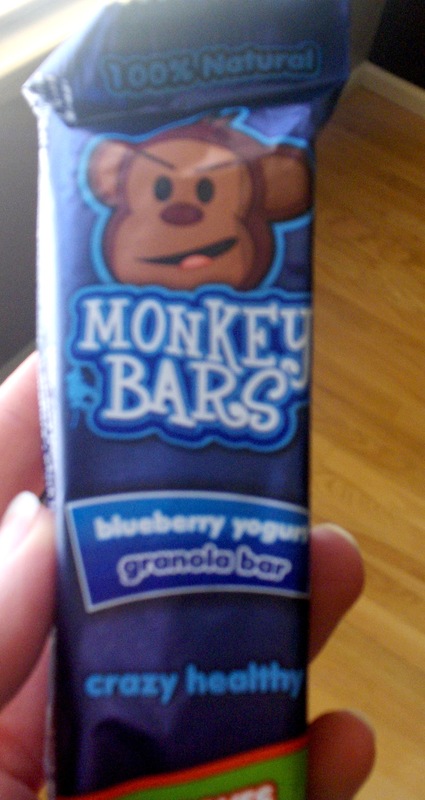 On the way home we tried the Money Brains Blueberry Yogurt bar. Verdict: Better than the Chocolate Banana flavor, and it had a yummy yogurty icing drizzled all over. Tasted like you are eating something unhealthy, but then you feel great knowing a bar a kid like bar could taste so good and be good for you too! It’s a win-win situation. 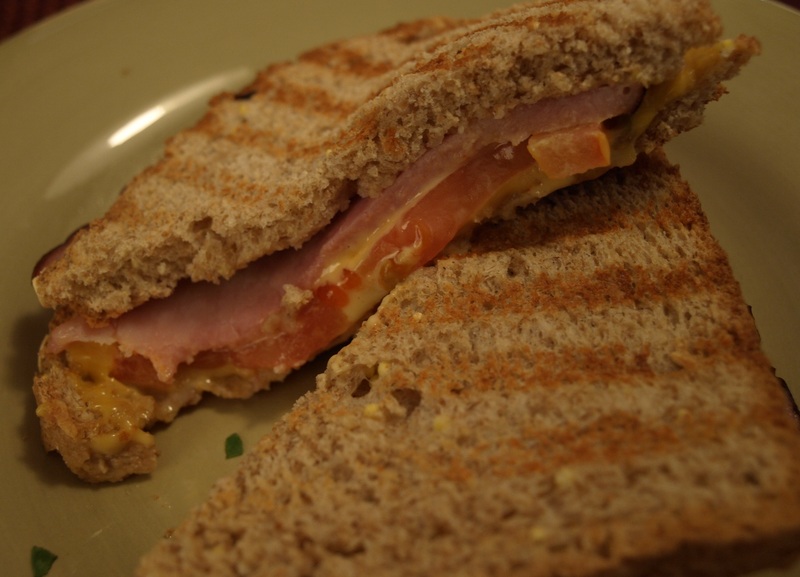 Dinner tonight involved our Panini press to make a grilled ham and cheese with tomato added for some flavor. 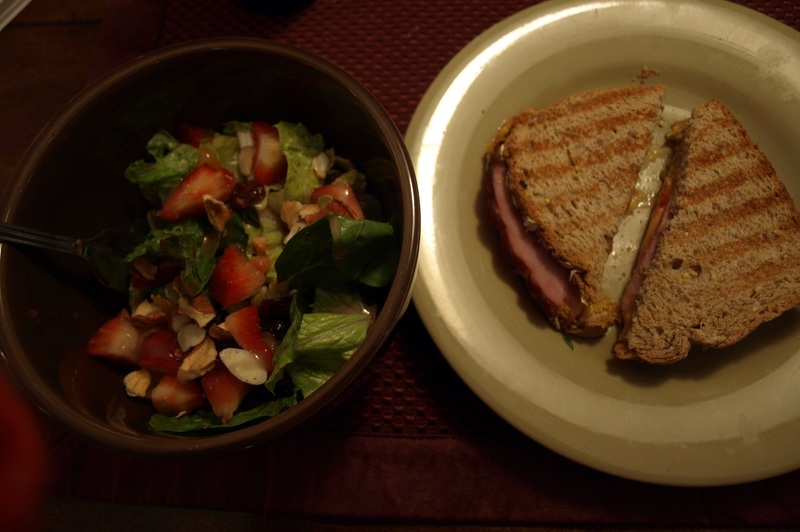 This was amazing, and healthy too being on multi-grain bread, and no butta! 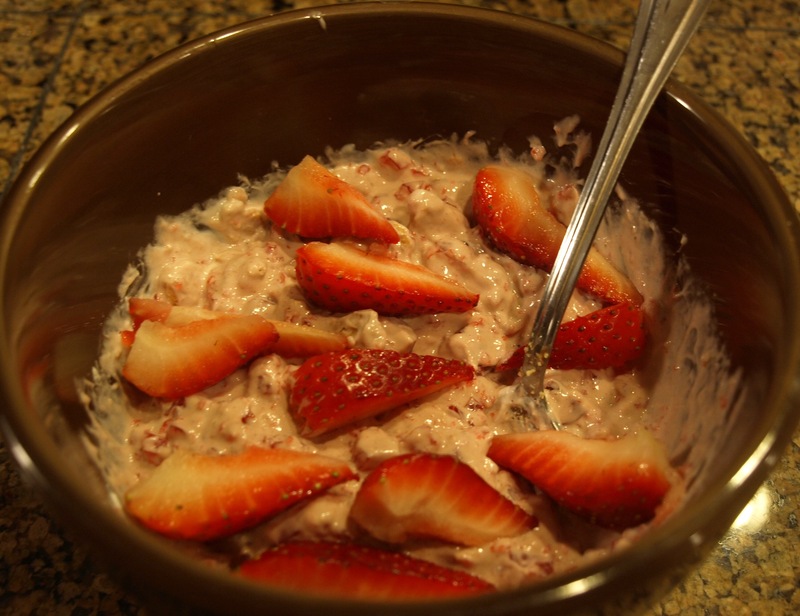 Dessert- Another Chalene Johnson original, Sugar free jello pudding with jello, whip, and strawberries. 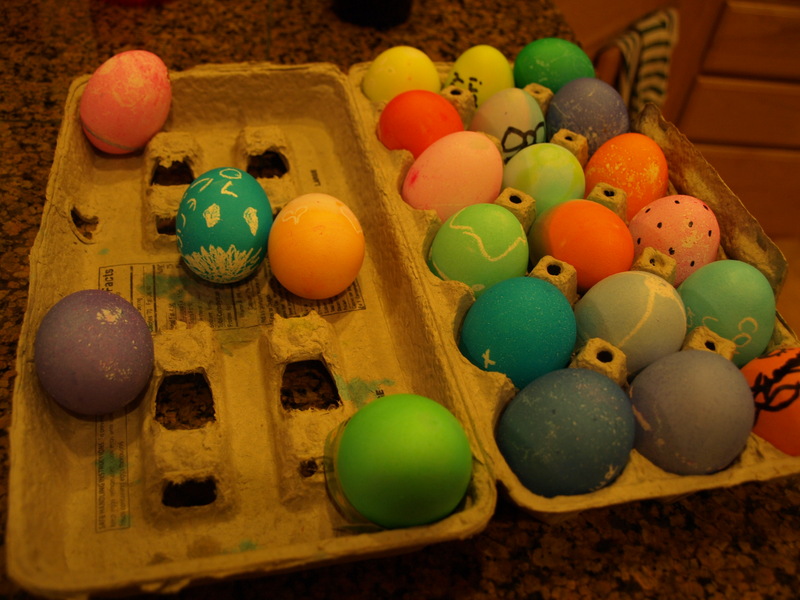 Even though we are 17, you are never too young to color Easter Eggs! All of us kids in the family exploded some color onto these babies tonight. And, I even whipped up a healthier homemade carrot cake to enjoy tomorrow for Easter. Kiwi is one of the 12 foods with super-healing power. This tiny, nutrient-dense fruit packs an amazing amount of vitamin C (double the amount found in oranges), has more fiber than apples, and beats bananas as a high-potassium food. The unique blend of phytonutrients, vitamins, and minerals found in kiwifruit helps protect against heart disease, stroke, cancer, and respiratory disease. Kiwifruit’s natural blood-thinning properties work without the side effects of aspirin and support vascular health by reducing the formation of spontaneous blood clots, lowering LDL cholesterol, and reducing blood pressure. Multiple studies have shown that kiwifruit not only reduce oxidative stress and damage to DNA but also prompt damaged cells to repair themselves. Kiwifruit are often prescribed as part of a dietary regimen to battle cancer and heart disease, and in Chinese medicine they are used to accelerate the healing of wounds and sores. ← Want some german choc. cake for breakfast? blown away by what you’ve written here. Not only is your review of my EasyLunchboxes fabulous (and I love the pics especially), the amazing meal you put together makes this mama proud 🙂 I’m thrilled you like my Lunch box System and honored to be featured on eat n groove. nice pictures and good content, these foods are healing power i think. fruits is the best food ever. Wow, that dessert looks wonderful. I’ve been looking for a recipe everywhere and still haven’t found one. I have most of the ingredients. I’m just wondering if I need to blend the jello into the pudding or something? 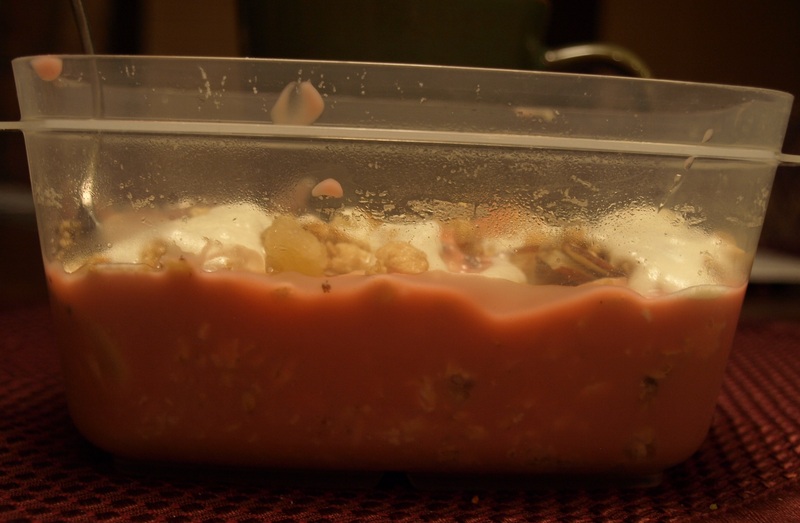 What kind of jello and pudding mixes have you used? Thanks. 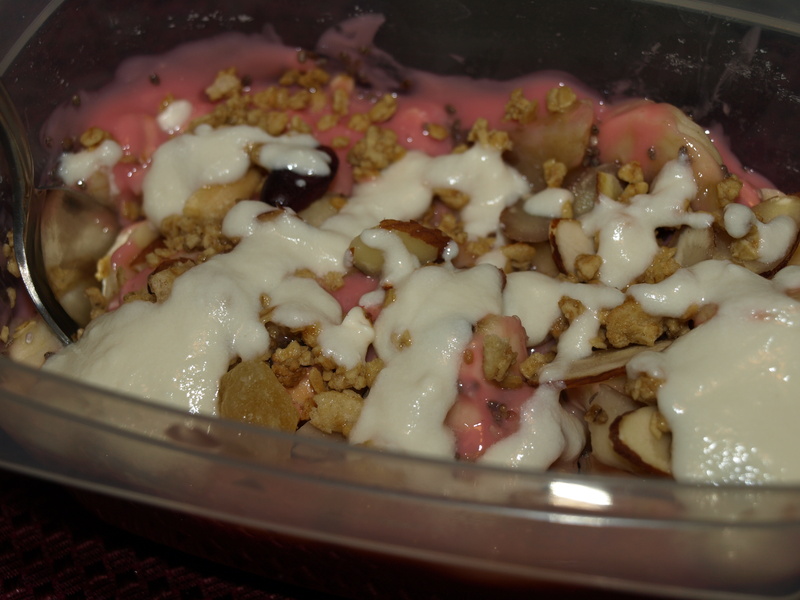 Then mix everything together, it looks like a big mess, but you are getting about a 100-150 cal dessert, and alot of it to eat! I’ll have to try it soon for a snack.